Monday’s run felt good. My legs were still sore from Sunday’s long run. I love it when I have an “easy” run. I even managed to get negative splits. On Tuesday I ran one of my favorite races – the Elmhurst Running Club 4 on the 4th. You can read my recap HERE. It was lots of fun. Then in the afternoon my sisters and I headed over to my cousin’s house to eat, talk, laugh, and have a good time. The rest of the week went pretty fast too. I did my tempo run on Thursday and felt pretty good. Well, it was done on the treadmill so I’m not really sure how accurate it is. On Friday I met up with a friend to finalize our plans for Alaska. We leave on the 19th!! We talked about how we booked this trip in August of last year and now it is almost time for us to leave. Saturday morning was another gorgeous day for a run. It was sunny but in the low 70s. Perfect! Sunday was back at Waterfall Glen for 12 miles. Can I tell how how happy I was that it was “only” 12 miles? The night before I filled up my hydration vest with water and left it in the fridge. In the morning I added 2 packets of Tailwind. I figured that was enough for my run. It was. I still had some water left over when I was done. 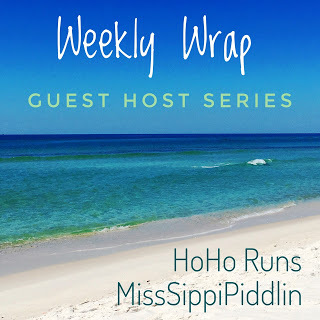 I’m linking up with Holly and Tricia for their Weekly Wrap. This week’s host is Christine at Into the Glimmer. Please stop by her blog and show her some love! I am also linking up with Courtney for her Training Recap Link Up! Another great week of training! I laughed at the Brussel sprouts meme, lol. I think that I dread my tempo runs more than my long runs! That’s so exciting that you are leaving for vacation soon! I’m sure it will be a great adventure!! I can’t wait to hear how you like the cruise! I came really close to doing it a couple of years ago, and I still consider it for my Alaska half. I hate tempos, but they sure do work. And I’ve done many a tempo on the treadmill and man! That’s hard. Thanks Judy. I’ve heard many great things about it. Your vacation sounds like it will a great time! Your mileage always impresses me…you are busy! Thank you. It is much more manageable for me because I am on summer break. It gets a bit difficult when I go back to work. For now I do what I can do. Great job on the speed work! Waterfall Glen looks like a nice place to run. It’s tough adding the weight of a hydration pack — to me anyway. I’ve never been to Alaska. How fun. Thanks. I am loving Waterfall Glen for my long runs. The view is pretty plus the terrain is so much better for my legs. I recover much faster. Great week! Your Alaska trip is going to be AMAZING! How exciting that you get to go to Alaska! Looking forward to your posts from that trip. Thanks Wendy! It should be fun. Thanks. That race is one I plan to do as long as I am in town. It is a great way to start off the festivities. Woohoo! Your vacation sounds like it will be a great time. I’ve heard wonderful things about Alaska. Great job with your training this week! Way to nail your tempo run. For me running on the treadmill always seems so much harder than running outside. Thanks. I’ve heard great things about Alaska too and am very excited about it. I feel the opposite. I find the treadmill easier than running outside. I struggle with staying on pace so the treadmill helps me out in that part. My friends are going on a Alaskan cruise soon too (not a running cruise though). I can’t wait to hear about your trip when you return. Thanks. I am excited too. I need to look into tempo runs. I want to go after my PR my next race and speed is my goal this summer. Girl, you are killing these training runs! 30+ miles in one week?? Impressive! I am absolutely hooked on Tailwind myself ….great for cycling too! Alaska???? Now that sounds exciting! Can’t wait to follow along! Have fun! Thanks! I am pretty impressed with it too. I had a great run when I ran 14 miles and again with 12 miles. Haha. I know, right? I mean 12 miles is still a lot of miles to cover. But I love it when the week before I did 16 and the following week I have 16 again. OMG your trip is so so soon! You must be ridiculously excited! Great week!! Thanks. Yes it is. I am excited too. Great job with your runs this week! OMG that snake would have freaked me out! Your Alaska trip sounds like such a blast, I need to look into that cruise…I can only imagine how incredible it will be! It did freak me out and at first I thought it was dead. That is why I took the picture. Then I saw it move and I ran away from it. Look at those speedy runs!! Way to run it !! Nice job with the plan last week. And I am so excited about the cruise!!! You may have said before, but why did you switch to a different Hansons plan? I’m also going to be trying a different Hansons plan this time around. My weekly total mileage is 30-40 miles and I wanted that extra rest day (Friday). I did not know this when I bought it but the speed/strength workouts are different too (12×1 minute, 6x 2minutes, etc). What? You’re not just going to Alaska, but you’re going on a RUNNING cruise? That sounds so fun! Tempo runs are my favorite, but I would hate to do one on a treadmill. You get bonus points for that! Yeah, I prefer to do those on the treadmill. I can watch TV and it makes the time go by so much faster. Nice week! I’m excited that you are going to Alaska! So cool! Looking forward to hearing all about it! Thanks. I am excited too! I think Alaska would be so fun to visit! And, I’ve never heard of a running cruise – how cool! Thanks. I have a friend that’s been on several to the Bahamas and always has fun. I am excited too! What a great week of miles! Kudos! Does the plan have you do any other cross training? Have fun on vacation- Alaska sure sounds exciting! Yes and no. I have two days to rest but I can cross train as well. Pretty much it is up to me. Great job this week! The Alaska running cruise sounds so fun! I can’t wait to read about it. Yikes to seeing that snake! The Alaska running cruise seems like an awesome idea! I wish you luck!